This comprehensive text expounds the pathophysiology, diagnosis, and treatment of lung disease associated with rheumatoid arthritis (RA), an autoimmune disease that primarily affects joints. Recent advances in therapy for RA provide the benefit of achieving a better outcome in patients with arthritis, and a large number of reports on RA are now available. Moreover, the American College of Rheumatology and the European League Against Rheumatism have proposed guidelines and recommendations for management of RA patients. Therefore, clinicians around the world can adequately understand how to manage patients who have joint symptoms in RA. At the same time, however, the management of RA patients who have lung problems has not been disseminated sufficiently, although lung disease is a common complication in approximately 30–40 % of patients with RA. Unfortunately, there has been a lack of tangible evidence regarding the pathophysiology, diagnosis, and management of lung disease associated with RA. 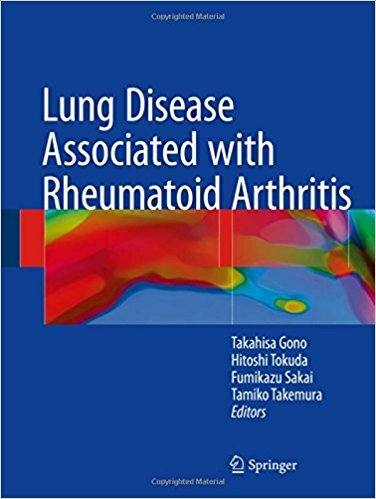 Each expert author in this book elucidates the current status of knowledge about lung disease in RA and the management of RA patients with lung diseases. Thus this valuable collection benefits not only rheumatologists but also respirologists, radiologists, pathologists, general practitioners, and medical staff such as nurses who are involved in the management of RA.